at a bank branch convenient to them. Mr.Dhoni must resign from one day Cricket. Already he earned huge Name ,fame and Money. 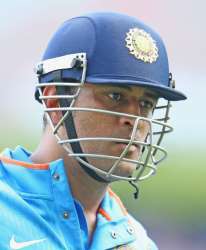 Now he must allow the second libe ro occupy the leadership .so Dhoni must resign!. Dhoni is not performing and also team is not performing under Dhoni Capraincy is the truth. So he is a failure leader. Agreeing and accepting this people request from the sports world Dhoni will declare his resignation from one day cricket is my recommendation. My comment to 92nd Birth Day Speech of Mr.Karunanidhi at YMCA ! on his talk he referred that mr.Ramanujar lived 800 years ago is need to be corrected , other wise his speech was very good. for information Ramanujar 1000th Birth Day going to be celebrated on 2017.so Ramanujar age is 998.
his speech was also very good but he failed to remember or to recollect that Mr.Kalaignar when he was the Chief Minister office his government ordered Rs 10,000 as welfare measure to the deceased or Government servant if dead while in Service. afterwards this amount increased by Both Mr.M.G.R. and Selvi J.Jayalalithaa. How ever Mr.Karunanidhi who brought this welfare basically to help the Family People belongs to a Deceased /Dead Government servant while on duty. before to this People know well about the situation and difficulties with the dead body How much struggle they faced to avail a fund to perform the basic rituals. But after this Government order by Mr.Karunanidhi that struggle was wiped out is also a truth. This welfare measure need to be mentioned by Mr.Stalin. but failed, why I do not Know! All right who is having the same tempo and Good Luck in His Birth Secret like Mr.Karunanidhi ? In My strong opinion that is the Only One Mr. Arul Nidhi - Grand son of Mr.Karunanidhi and Son of Tamil Arasu. Tamil Arasu who will not appear in political Grounds but he is very admirable and affectionate in the sons of Mr.Karunanidhi is also a truth. He will dominate and he will establish a circle and will run around in Politics in future . Actually we resemble in one that is My Birth is on 3rd Feb and my dear your Birth is on 3rd June. we Have interest in People welfare your way in Politics is well established. well done.let me come to the topic. when he spoke he said that he is directing and writing Dialogues to a Future film Ramanujar. a great News to Film Industry . But here Mr.Karunanidhi Confirmed that he is going to Address god and Religion. Mr.Karunanidhi is surrendering Himself to Lord Vishnu. my Best wishes. Ramanujar who was not a Vaishnavan in Birth but He attempted to become and wanted to Live on the Principles of Vaishnavism is the truth. Ramanujar who ascertained '/gained / obtained Huge boundless Knowledge in all religions is the 100% truth. Ramanujar has said that he would not fear to come across Allah ways and means informed through Holy Quran. Ramanujar a Great saint from Tamil nadu born at Sriperumbudur lived for a long time along with Thiru Kachhi Nambi was a long Story. Ramanujar was a scholar in all spheres of all Religions is also a truth. Ramanujar shown his major interest to share/spare all /entire knowledge from him to Vaishnava Jeer's and all Mutt's of Vaishnavam. Ramanujar never said any thing Bad about /against any religion on earth is the truth. But he wanted to lbe a Vaishnavan so for that to get the sanctity he wished to assign himself for Samarayanam" or samashnam or Sangu and Chakra symbols endorsing /stamping on his shoulders and wanted to get Wooden Cheppals called Baranyasam to become a true sage or sanyasi in the world. Ramanujar who made all attempts and invented the Nalayira Divya Prabandam from a hole in a Neem Tree. That is called Budam Puliyam Kudi. In a Neem /Puliya Maram Tree hole 4000 Divya Prabandam was found / availed through Ramanujar. Ramanujar also known as Bashyakarar . Ramanujar used to offer many Bashyam that is illustrations in many veda and vedanta of this world. No one could win Ramanujar on any debate on Divine messages of vedas and vedanta in sanskrit across the world is the known record for about 1000 years. Ramanujar had all /entire knowledge than any body else of that time. But to get the samasrayanam he follwed Jeers . One fine day Shri Nambi Jeer who asked him to come to Kanchi to perform that samahnam or samasrayanam . But it could not happen1. in those days their was no transport even Bicycle. to reach Jeer Mutt in time become difficult. so Ramanujar approached Jeer of Jeer Mutt for The Second attempt . this opportunity was offered to Ramanujar at Trichy sri rangam. But here also due to lack of Time that ceremonial Function could not Take place. Than Ramanujar was asked to come to Madurandagam sri Kodanda Raman Temple. Here by walk Ramanujar reached in time. in the scheduled time His Holiness Nambi Jeer did Samarayanam or samashnam to Ramanujar . and that SIlver Rods with fixed Sangu and Chakram were the instruments used to do samasrayanam to Ramanujar is still available in Kodanda Ramar Temple Madurandagam for People / Public witness in Ramanujar Cabin/room or Sannidhi. This is the speciality of this Kodanda Ramar Temple at Madurandagam My mother Nativity. Similarly Ramanujar who compiled Ragasya thrayam that is secrets are given to Jeer Mutt's How ever after he got the secret teaching to attain the lotus feet of Lord Vishnu ,he wanted to establish the secret to be revealed to all people though it is wrong that is Guru drogam ,he was more successful in rendering that Message to all surrounded near Temple and he told all secrets to people from the top boarding of the Temple is the Truth. Here we must know at the age of 120 years Ramanujar died. About Ramunajar we can hear and say many more but here I specified few matters to confirm that Mr.Karunanidhi is leaning towards Lord Vishnu and or the God. He is interested to direct and write Dialogues to Picture Ramanujar means Sri Ramanujar a great saint dragging Mr.Karunanidhi towards Lord or God and Nothing else is the truth. In Christianity you will find A.d and B.C. in Vaishnavism No way to before Ramanujar or After Ramanujar. Only Ramanujar. yes You must have seen all happening's in Vaishnavism that is "Srimathe Ramanujaya Namaha".you can see this is the only sanctity name even you could see or witness many Mutt's in Vaishnavism . All religious leaders till date never write or say any thing with out Srimathe Ramanujaya Namaha. is the practical truth about 1000 years. Jeer's Andavar's or parakala mutt jeers ,Pandaripuram Jeers and other Mutt's and religious leaders of Vaishnava community never speak (Pravachanam)about their speciality or importance all in word speaks about the importance of Lord Maha Vishnu after saluting with the word srimathe Ramanujaya Namaha.Only. Last but not the least Ramanujar wrote all books in Sanskrit only. But after him His Holiness Vedanta Desikan who lived and did all religious duties with right performances and wrote Books in maximum Numbers in Tamil Language . So Mr.Karunanidhi must emphasise that Tamil is a versatile language and it is more than 5000 years age or the time world or earth founded by Human or living ,Tamil Language would have born and dominated. Including Mr.Karunanidhi knows well How far the Tamil Language is ruined by Film Industry and that has to be addressed on painful addressing as a special interest in tamil Language . I believe that this is enough about the meeting and to Mr.Karunanidhiji from My Table. Regards. Rest in My Next post. Humble request - as a elderly and aged Politician ,May please look for the ways and means to separate Politics and Religions. this is my strong recommendation and this could be a solution to religion in social life. People can enjoy any religion or caste . But politics know that today a survival in a day need Rupees 700 minimum so a total of 21000 per month. So Union Of India must declare by law that a family which receives less than 20999.99 are entitled for all benefits or welfare measures of Government. This will allow all people in struggle will start enjoying the Welfare measures of Government as son's of soil right. Here Politics can make a full stop to Religions involving in politics. Both will become parallel lines of Life track. Forward and Backward can be wiped out. People live in Mountain regions (malaijathi makkal) Tribals need to focused more on welfare than any people of this society. Wishing you a Happy Birth Day and Many More Happy Returns of the Day. Good Luck and Good Day.